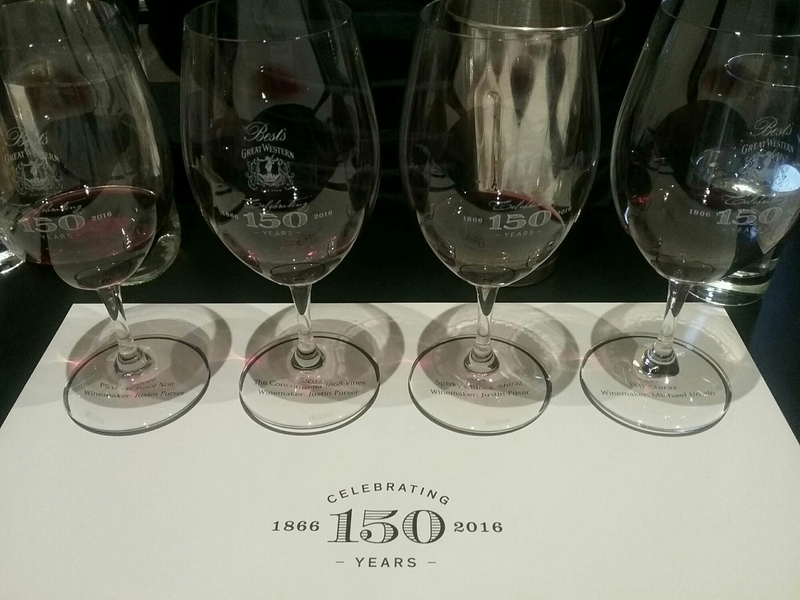 On a slightly grey Melbourne day, a select group of wine writers boarded the mini bus from Tullamarine Melbourne Airport to head to a tasting of Best’s Great Western celebrating their 150th anniversary, with the Thomson family and the remaining wine makers (RIP Trevor Mast) present. There was the usual greeting of colleagues flying in from all corners of the globe at the airport. A somnambulant Nick Ryan spoke of Nick Stock and room service Club Sandwiches in euphemisms while Winsor Dobbin was being Winsor. We arrived at the reputable Jimmy Watson’s in Carlton, headed upstairs to a cozy, standing room only chamber to find the excellent team from Fireworks PR had prepped the room ready for the presentation of a vinous history of Best’s Great Western. As the family fielded general questions before the winemakers took over on the specifics, Viv Thomson was asked what he saw was the biggest challenge in growing grapes and making wine in Great Western. He replied that the distinct lack of water is the main issue as the subsoil dries out. He see this being a cyclical 20 year issue. My family still work the land, every farmer thinks the same Viv, every farmer. The whites were presented first…..
Justin advises we “Smashed the new foudre to take the overt oak from it” but it still made its presence felt. Pretty smells, soft lime, just oak nuttiness to give point of difference. Delicious texture, quartz minerality of the region allows the structure to carry long with lime pips and cumquat. Peach fuzz and popcorn notes, cheese slices. Bright centre of fig and lemon fruit wrapped tightly. Finishes with well structured acidity and elegance. Michael advises that sometimes the Chardonnay block gets frosted, showing that Great Western can get cool. Mature nose, brown sugar caramels, preserved lemon, turning to dairy. Still with nutty, fresh stonefruit flavours, elegance, light rockmelon and primary oak spice. Well aged with plenty of time left. Simon mentioned that there was “Delicacy from 1990 onwards” due to the advances in technology in pressing, filtration and vinification. Pressings were left over for the “Victoria” labelled Riesling….else it was sent for brandy! 5 weeks cold settling. Slight seaweed, iodine, baked limes, preserved /dry fruits, a touch of animal musk note, sweetish lime panna cotta. Still with full texture, but fruit lying low. Zings with acid after all is said and done. Tying to get through the cork and oxidation. Lime marmalade nose, whilst a touch of residual sugar seems to just keep a small spark alive. Others in the room had a better example. Shame as this is my birth year wine. Labelled “Hock.” Soft mushroom cap age, pith and quartz. Time has marched on but there’s still an elegant structure, even if light bodied, with the ghost of cumquat fruit haunting the palate. In between the Whites and the Reds, the Fireworks team were quick to change over whilst one of my favourite wine people, Sophie Otton finishes off her notes. Sourced directly from the cellars of Best’s. No new oak. Lightly spiced and woody, just starting to see a Vegemite secondary note, roasted meat jus, prunes, light iodine, just fired shotgun wad, champignon mushroom. Mature with toffee, spiced plums, dark raspberry fruit, black pepper, light sandy tannins. Still very much alive, absolutely delicious. A treat to taste. Sweet marshmallow, coconut Iced Vovo, dog fart meaty note and black fruits. Core of sweet fruit with just American oak coconutty, vanillin note. Blackberry fruit and sandy tannins, warming and a touch of a herbal finish. Full bodied and showing little sign of slowing down. Smoky, graphite, boysenberry, black cherry, dark and sparky. Quite brooding, savoury balanced with a dark heart of fruit. Tannins are firm, drying (oaky). A unique beastie among the line up. Pencils, mineral, aromatic, earthy, cracked black pepper spice, dark fruit, kindling campfire smoke. Minerality and savoury qualities with dark, black fruits and just pruney. Tannins are sandy sheets and still mouth coating. Still strong with teeth cutting acidity, brooding and powerful. Fresh cuddly oak, parmesan cheese rind, lemon tart, tight pippy berries and black pepper. Full palate, deceptively primary. The tannins are firm, the fruit is dark, fresh and still beautifully balanced. “Ticks every box” Simon Clayfield. Chambord like fruit smells, cinnamon, orange zest, light lipstick, baby white mushroom cap, minty/eucalypt. Medium palate with drying but still refined tannins. Dark cherry flavours float above the structure, feels like a parallel, dual palate…the structure and tannin moving underneath that fruit. Fresh, minty, raspberry and cherry. PS stands for the “Pig Sty” vineyard and 141 references the number of vines which are are 148 years old. Potentially the oldest Pinot Noir vines in the world. Oranges and smoked bacon, delicate, yet powerful and refined. Intense black cherry, that hits hard then peacock tail to ethereal phantoms with orange juice like puckering acidity. Tannins are almost perfect for such a young wine, but the potential for age is immense. 300l hogsheads. 50%PM with a dash of 2015PM, dolcetto (malbeck from the original notes)and shiraz. Perfumed, purple, almost fresh ferment smells, fruits of the forest ice cream, smoky notes. Spice and pepper, with stemmy tannins. Some oak influences nowm but very unique and a wine of place. 1970 vines. 1st individual wine from the vineyard, loam soils. Sandy, black, cassis, perfumed with soft white pepper. Fruit forward from youth, but tight raspberry jube with bright bright aspects. Stays playful with tension, and a flirty promise of the future. Frost year. Dark fruit, blackberry, mint and eucalypt, pencil with breakfast plum/prune that blossoms to pretty flowers. Balance is still outstanding, dark plum, just chocolate, yet the body and flavour still youthful. Tannins are still firm and present. An elegant shiraz.